“Stop trying to ‘fix’ yourself; you’re not broken! KEEP YOUR EYES ON YOUR OWN BEING. FOCUS ON YOUR OWN LIFE. HOW CAN I ENCOURAGE CHANGE IN MY LIFE AT THIS TIME? WHEN WE CHOOSE TO BECOME CONSCIOUS OF OUR OWN BODY/MIND/EMOTIONS FROM MOMENT TO MOMENT, KNOWING THAT IS THE ONLY TRUE CONTROL WE HAVE IN THIS LIFE, WE BEGIN TO RELEASE THE NEED TO COMPLAIN ABOUT & REJECT THE EXPANSIVE, EVER EVOLVING WORLD AROUND US. HOW MUCH TV/INTERWEBZ DO YOU WATCH WITHOUT CONSCIOUS INTENT TO LEARN/GROW? HOW MUCH NATURE DO YOU ENJOY? HOW MUCH TIME DO YOU ALLOW YOURSELF IN A DAY JUST TO BE IN UNION WITH BODY MIND SPIRIT IN QUIET & DEEP BREATHING… IN AWE OF YOUR HUMAN HEART BEATING AUTONOMICALLY TO MAINTAIN YOUR HUMAN BEINGNESS? WE CAN LEARN TO QUIET THE STORMS WITHIN. AFTER YEARS OF MANIC DEPRESSION & SELF DESTRUCTIVE HABITS (ALL OF WHICH I GENETICALLY INHERITED OR LEARNED FROM OTHER INFLUENTIAL HUMANS IN NY LIFE) I FINALLY DECIDED TO BE MY OWN BEST FRIEND. MY OWN MOTHER. MY OWN MENTOR. MY OWN PRIMARY CAREGIVER. FROM HERE, EVERYDAY IS A PRACTICE IN SELF LOVE. FROM HERE I LEARN TO ENCOURAGE MY OWN HEART IN CREATIVE PASSION AT EVERY CORNER. FOLLOW YOUR CURIOSITY. LET OTHERS INSPIRE YOU TO TRY NEW THINGS. IN FULL MOON FASHION WE ARE ALL BRIMMING WITH POTENTIAL AND MUCH DARKNESS TO BE PURGED RELEASED. HOLD TIGHT. MIND YOUR STRONG EMOTION. THE LUNAR POWER OF THE FULL MOON WILL LEECH YOUR PAST FROM THE DEPTHS OF YOUR CELLULAR STRUCTURE. WE ARE CONSCIOUSNESS ENCLOSED IN A LIVING OCEAN. EACH CELL HOLDING THOUGHTS AND WORDS FROM EONS PAST. CONSCIOUS RELEASE AROUND THIS POTENT GRAVITATIONAL PULL IS LIVING MAGICK. WHAT WILL YOU LET GO OVER THESE POTENT DAYS TO MAKE ROOM FOR YOUR FUTURE SELF? WILLING SHADOW WORK IS THE MOST POWERFUL GIFT YOU COULD OFFER YOUR SPIRIT WHILE ON THIS EARTH. WE ARE TRULY EVOLVING INTO THE NEW HUMAN. ARE YOU IN?? EXPLORE THE SOLAR SYSTEM & OUR MAGICKAL GUIDES WITH ME DAILY. Full Moon is when the moon has reached its zenith, it forms a perfect silvery sphere in the sky. This is a time for spells that transform, increase psychic ability, for fertility spells and invocation to lunar goddesses. This is a time of strength, love and power. At this time the moon represents the Goddess in her Mother aspect, give praise to Cerridwen, Isis or one of the other Mother Goddesses. The period of the Full Moon lasts from about 3 days before to 3 days after the actual full moon. Span: Fourteen days to seventeen and a half days after the New Moon. Matters of the home; Beauty; Money; Creativity; Psychic abilities. A time of heightened feelings. Not a good time for major decisions for they will be colored with emotional debris. Wounds bleed more, and the formation of scar tissue is more pronounced. Major workings should occur now. This is the climax of the obvious moon power. Relates to the Growing plant as it pierces the ground. 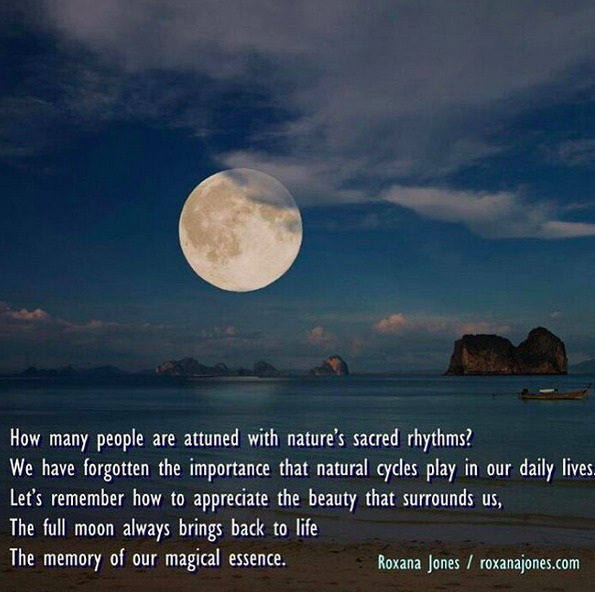 Many people feel the energetic buzz of the Full Moon. What’s cool to note, is that it always means the Sun and Moon are in opposite Zodiac signs. It’s a super charged time, but also one of balance. The solar yang and the lunar yin are in harmony. 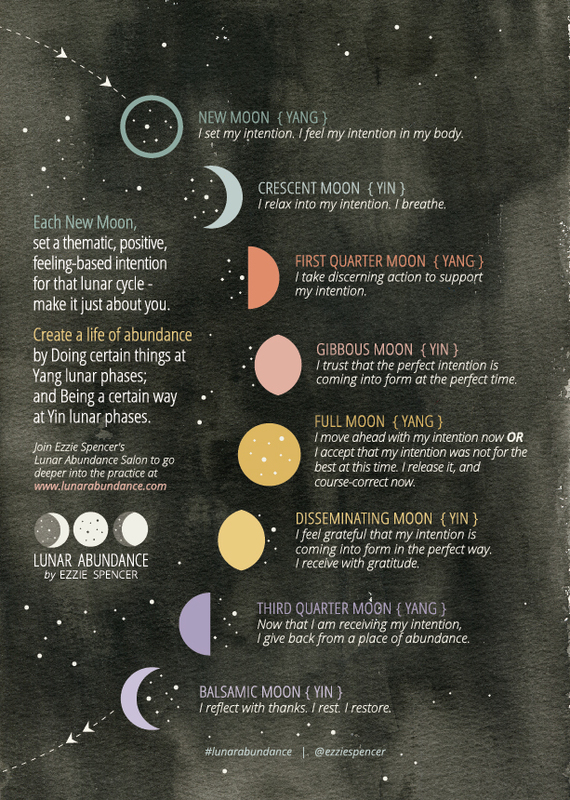 The Moon has been waxing (increasing), and if you set new Moon intentions, you’re ready to act! In the hum of the jolty energies, there can be epiphanies about things that were vague desires at the new Moon. Make it real, with tangible actions, perhaps a ritual that signifies you’re ready to integrate your intent. Every month, you have a chance to experience a fresh start. The Moon’s waxing and waning is like the shortest hand on the cosmic clock. 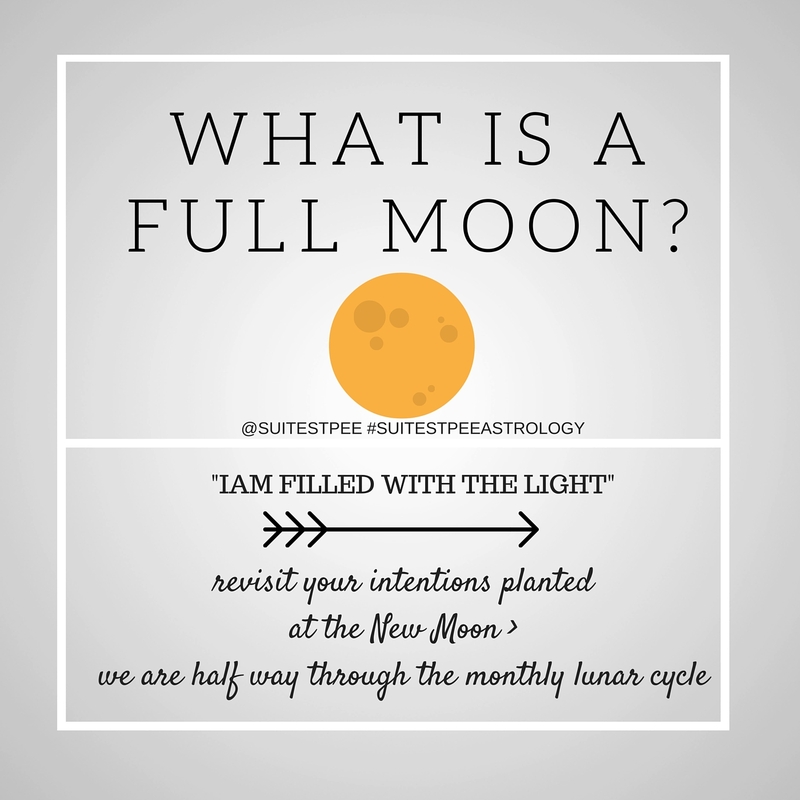 The intentions we set with the Moon can get specific, and match the traits of the sign that month. This is a way to stay attuned to cosmic currents, and go with the flow. It’s a constant in a chaotic time, that the Moon waxes and wanes. Each lunation is a chance to set new goals, and feel closer to a bigger mystery. So here’s another formula for honoring the Full Moon: Instead of running from werewolves, become one. Mark your calendar and plan a Full Moon dropout from your regular routine. Make it a date between just you, your spirit, and the Moon. Surrender fully to your ancient wild self. I doubt you’ll really go crazy. You just might feel more sane. 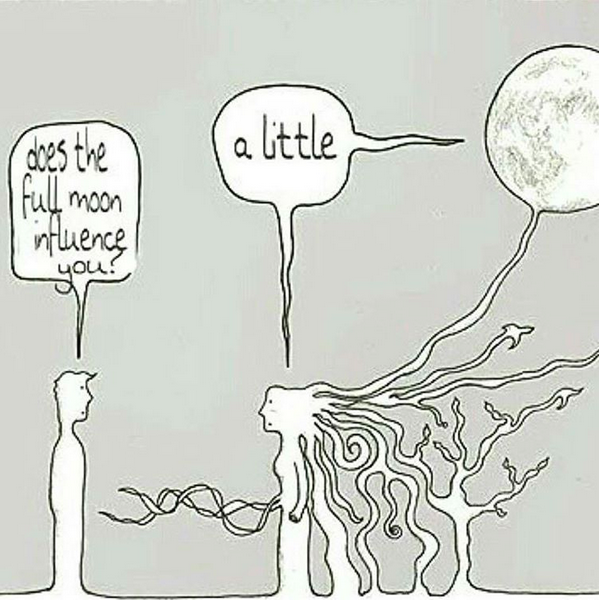 And if you’ve got the urge, know that it’s quite all right to howl. A peaceful monk or a howling werewolf: the Full Moon makes sense of them both. There may be no greater emblem for reconciliation and wholeness than the Full Moon, rising at sunset and setting at dawn, filtering the dark with light. It’s the only Moon phase that shines the whole night through. That one side of the planet finds clarity in the Full Moon and the other sees lunacy simply sings of the moment’s astronomy: there is an opposition between Sun and Moon. #LUNARABUNDANCE CHART BY EZZIE SPENCER! Astrologically, the Moon represents the emotional and feeling part of the psyche, along with intuition and creativity. It is our most immediate connection to the personal unconscious, and as such is our first connection to the non-physical realm. The Moon contains the most personal aspects of who we are, including our most primal need for interpersonal connection, the root of which lies in the relationship with our mother or primary caregiver and family-of-origin. The Moon symbolizes our need to receive nurturing and indicates what makes us feel nurtured, as well as how we like to nurture others. The Moon is our most primal Inner Child feelings, both in its fragile tenderness and its bawling glory. As our quintessential planetary emissary of the element of Water, the Moon’s energy moves fluidly and magically from one intuitive impression to another. The Sun, on the other hand, symbolizes our central sense of purpose and identity. This is our basic driving force which propels us through life and into new growth. It expands and shapes who we are, like greenery flourishes from seedlings into full plants and trees under the Sun’s light and heat. It is our primary sense of self and typically shows who we see ourselves as being, inside, which is often different from how others see us from the outside. As the main vehicle that drives who we are, it also fuels our will power and conscious intent. The Sun is our principal planetary ambassador of the element of Fire, and as such its energy burns brightly, inspiring us to shine and radiate the spirit of who we are, for all to see. When the Moon reaches Full, whatever has been developing now reaches full aperture. The Sun and Moon are now opposite each other in the sky, at maximum separation. 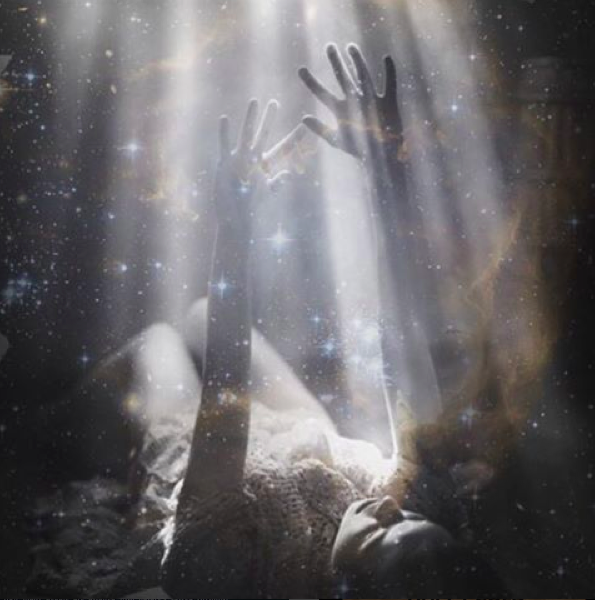 Lunar energy has fully emerged from the darkness of the unconscious, made fully visible by the light of the Sun’s conscious aware-ness and experience. The hidden possibilities of the New Moon are now birthed into the actualities of the Full Moon, associated with the Mother. Psychologically, our experience of the internal realm is at its peak now—emotions, needs, intuition and our connection to the enchanted unconscious. If we lack awareness of our inner dynamics, or if we have not yet learned how to separate our inner emotional drama from our outer behaviour, primal impulses may explode out before we realize what is happening. 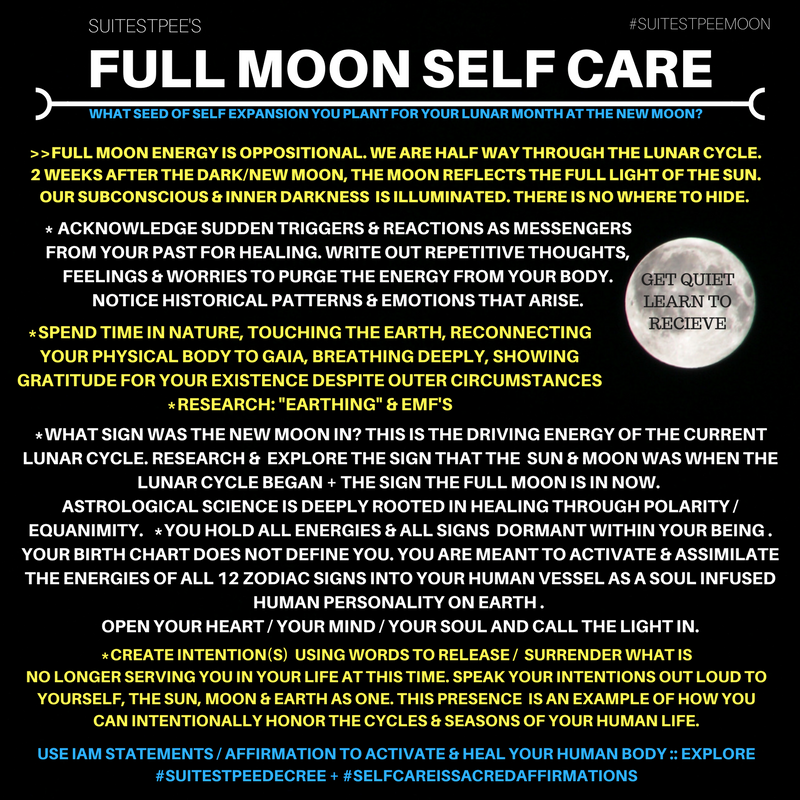 If we have cultivated some self-awareness and learned constructive ways of dealing with our passions and feelings, the Full Moon can be a time of harnessing powerful energy. THE POWER OF LUNAR CYCLE WITH WENDY GUY AT EVOLVING DOOR ASTROLOGY! TO RE-CHARGE YOUR BEAUTIFUL BODY! So tonight and tomorrow under the [Full Moon], be outside. Use the lunar energy to help you re-charge. The energy is high and your body electrics are being upgraded…let’s go soul troopers! © 2015 Elizabeth Peru/Deltawaves. All Rights Reserved. The pain of life can be overwhelming. Whether physical, emotional or psychological sickness, most often we just want it eradicated, right now! Maybe you feel uncomfortable in your own skin or super-sensitive to subtle signals that all is not well. This tense [time] can tend towards over-reaction – intense concentration on what is WRONG. It takes time to heal so give yourself the time it needs, not the time you think is acceptable. Be tender, be kind, treat wounds with the love and care you would show towards a child. In suffering you learn about the depths of your strength. Sometimes it’s necessary to sit with the pain, own it, accept it. Open your heart to it, just a little. Know that your pain doesn’t define who you are. Healing comes from acknowledging your weaknesses. 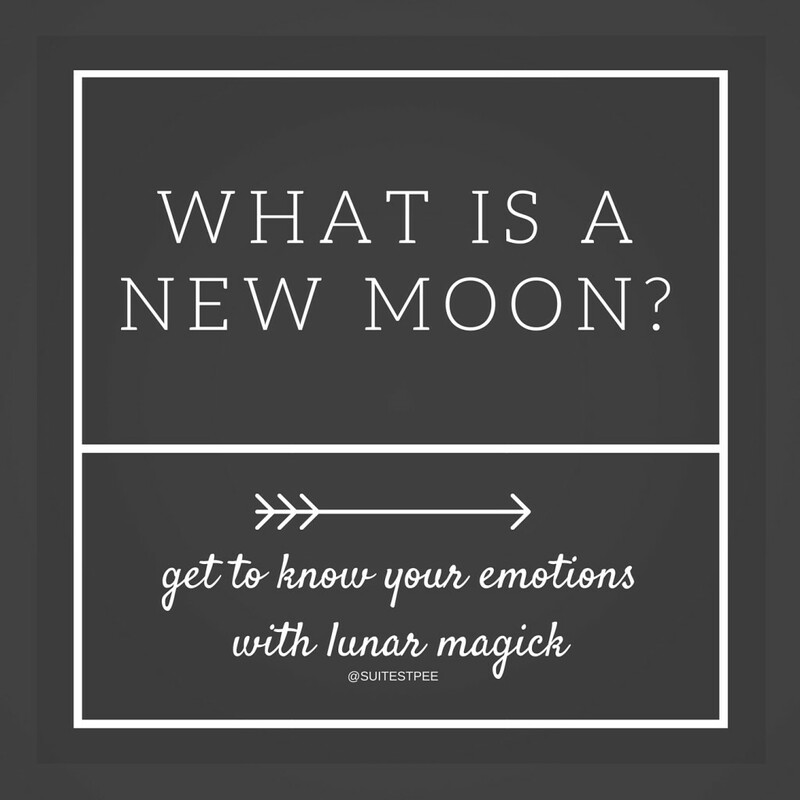 WHAT IS A NEW MOON? CLICK HERE TO LEARN MORE! YOUR MOON SIGN, NEW & FULL MOON MAGICK, RITUAL & MANTRA! ©Tessa Ridley/Self Care is Sacred. All Rights Reserved. 2018.